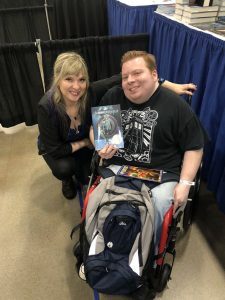 Jay Goes BACK To Comic Con! Wizard World Comic Con (www.wizardworld.com) will be in Des Moines at the Iowa Event Center THIS WEEKEND and it’s gonna be a total blast! I have been to the last three years and there is literally something for everyone at this convention. They have comic books (obviously), amazing artists, comic book creators, novelists, tons of cosplay and the list goes on and on. One of my favorite things is the Q & A panels with actors and creators of some of your favorite comics, cartoons, and movies! 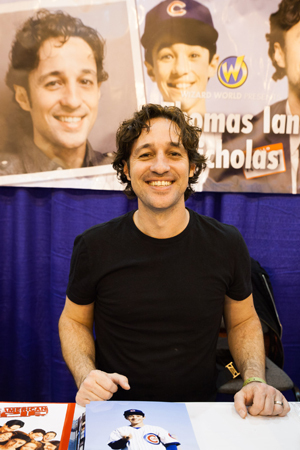 I had the privilege of talking with actor Thomas Ian Nicholas from “American Pie” and “Rookie of the Year” last week. Thomas will be at Wizard World and this interview was a lot of fun. 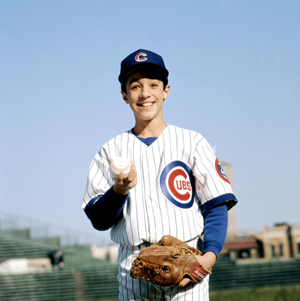 We talk about “Rookie of the Year” and the possibility of a sequel!! Yeah, that’s right they are working on bringing the gang back again. Early talks though, nothing concrete. We also talk about “American Pie” and that another installment of that is in the works too! Thomas also talks about his band, his son getting into acting, his new movies a lot more. Give it a listen he was a super nice guy and I think you’ll really like it. 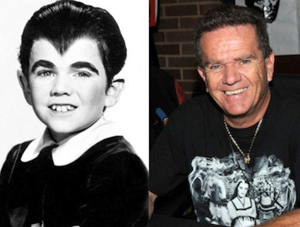 I love this time of year because I get a chance to talk with people I never imagined that I’d ever talk to, like Eddie Munster. Never crossed my mind. Here is my interview with Butch Patrick. 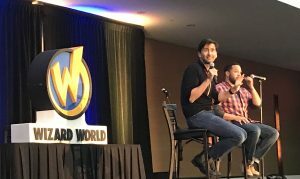 JAY’S RETURN TO WIZARD WORLD COMIC CON 2018! So as it turned out, I DID GET TO GO TO THE SHOW AFTER ALL! The whole time going into this event my plan was to record some interviews (above) and talk about it as much as I could because I was going to be in Minnesota Friday and Saturday and wasn’t available to go Sunday either. After a change of plans and the nerd gods shined down on me I was able to go on Saturday. Also, sidenote, if you’re going to go for one day, Saturday is the day to do so. As soon as I find out that I’ll be there I get online and schedule a photo op with David Tennant(Doctor Who, Jessica Jones, Ducktales). My wife and I are huge Whovians(Doctor Who fans) and obviously we were going to get our picture taken with THE DOCTOR next to his Tardis! Scheduled. Wow, it’s becoming more real by the second. 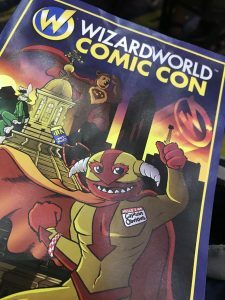 We pull up to the Iowa Event Center around 12:30 and grab our credentials for the awesome staff at Wizard World and it’s off to nerdland. First thing I see is Kato Kaelin(OJ TRIAL FAME) as the hype man and entertainment guru for the main stage. He’s instantly there to get you excited and hyped. It works. My wife and I split up and start to wonder. 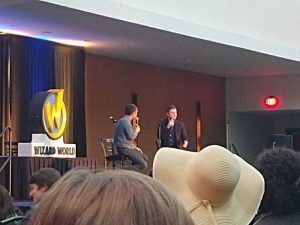 My favorite part of Wizard World are the question and answer panels with fans and actors/creators. This is the stuff that really makes me happy. It can also lead to some cringy awkwardness too. Why? Fans. We are weirdos. Nice weirdos for the most part but still. I love it too. My wife has anxiety about it but that honestly makes it more fun for me! So as you can tell by the super sweet picture, I got in late. I was distracted by toys. I’m sorry, I had one job to do! Winstone Duke starred in both Black Panther and Avengers: Infinity Wars. He got a few questions thrown his way about upcoming Marvel stuff, and of course, he can’t answer those types of things. He did say how much he appreciated being with such an amazing cast of actors like Chadwich Boseman, Michael B. Jordan, Forest Whitaker, Lupita N’yongo, and many more. He said they were very close. Speaking of “CLOSE” he and Chadwich did make contact a couple of times while filming a scene in Black Panther. Duke’s character in Black Panther is a brutal warrior and Winston couldn’t be more the opposite. He’s soft spoken, articulate and very rarely resembles M’Baku. Oh and his favorite animal is a Cheetah. Not sure why that seemed important to put in my notes but hey. 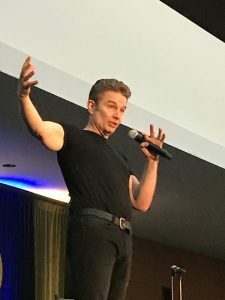 I’ve seen James Marsters(Buffy the Vampire Slayer, Angel, Runaways) before and he is really great at these panels. He is a great storyteller and you can tell right off the bat and he genuinely enjoys being there and interacting with the fans. You don’t always get that. 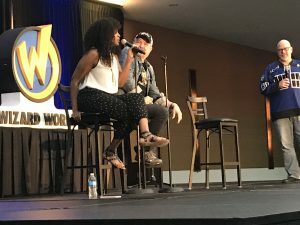 I’d say he and Robert Englund(A Nightmare on Elm Street) are the best panels I’ve seen from Wizard World. 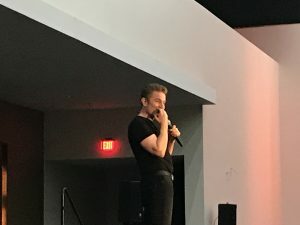 First question he asked was I’m sure old hat by now, “Who did he want Buffy to end up with, Spike or Angel?” He said he thought that Spike, on the Buffy series, wasn’t ready to be with her but that he was the ultimate relationship for her. He said the episodes “The Body” and “School Hard(his first)” were his favorite episodes. Other than the musical episode. A lot of people praised his work on The Dresden Files audio books. Like, a lot. I was pretty surprised. Usually people stick to the tv shows or movies but not this time. My wife instantly downloaded a book. When it came to prepare to be in Marvel’s Runaways, James said that he didn’t read the comic a head of time because he didn’t want to feel like he was doing an impression of the character based on the book. He also said that when he’s acting he gets extremely attached to his characters. So much so that when he says goodbye to them or they die he said a part of him dies too. Like I said before, he is my favorite person to see on a panel. His in-depth answers and his appreciation for the fans and the fandom in general comes across and it draws you in. Before Jim was on Supernatural he was on Deadwood and a fan asked if the rumors of a new movie to finish the series were true. He said he knows there is a script and that he heard it was great. He hasn’t read it but that producers are checking actors schedules for the fall to potentially do something but that he wasn’t involved. Wizard World was a blast! I’ll post all about it at yourfortdodge.com tomorrow. This was a pretty great moment. 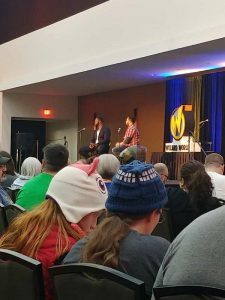 David Tennant from Doctor Who, Jessica Jones and Ducktales singing the Ducktales theme with the audience. Perfect way to end the Panels for me! Unfortunately I wasn’t able to hit up the Elijah Wood panel but I believe Curt(below) will be able to help with that. Before my wife and I left we got a photo op with David Tennant when he stepped out of his Tardis. It was a surreal moment. It was super brief, barely said a word but still a neat experience. Wizard World as whole is like that. There are sometimes too many things to see that to try to stuff them all into a day just doesn’t work. If you want comic books, cosplay, collectibles, art, schmooze with celebrities…it’s all there. I will say it does feel like each event is getting smaller every year which is too bad because it is fun and a rare time for a lot of people to experience events like this, myself included. I’ll keep going every year that is here and I think you should too. Wizard World 2018 has come and gone, sadly, as it’s one of my favorite times of the year. Even with Jason Momoa cancelling the star-power was through the roof. If you’re a fan of TV or movies or comic books, there’s something at Wizard World for you. My day started off right at 1pm with Winston Duke who played M’Baku in Black Panther and Avengers: Infinity War. He spoke about how Nigerian tribes influenced the look and feel of his tribe in Black Panther, the Jabari. Winston mentioned where he came from, Trinidad and Tobago, specifically just the island of Tobago, how he’s proud to represent them in Hollywood. When The Fast and Furious movies came out they were a big hit in Tobago, but being as they have one two land highway there, it’s a bit difficult to drag race. Mr. Duke was asked about an upcoming project he’s attached to, Jordan Peele’s second film effort called “Us.” He couldn’t say much, and being a veteran of the press circuit under the Disney umbrella, Winston knew exactly what to say – he couldn’t say anything at all. Winston was awesome, very charismatic and seemed to genuinely enjoy hanging out and talking to everyone. 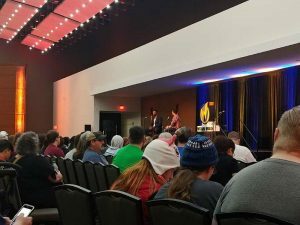 If I’m not mistaken, I believe I saw Des Moines was one of, if not his very first comic convention. Handled it like a pro. Following Winston Duke’s panel, we adventured down to the main floor to check out all the vendors. Boy howdy, it was like Christmas. An entire convention floor dedicated to art, action figures, comic books and costume props. I wish I had words for the sheer amount of Funko Pops I saw and wanted, but all I can come up with is “a metric ton.” In the end, I walked away with zero collectables. 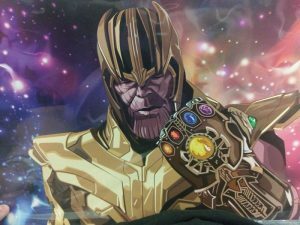 Which is fine, because what I did come away with is an AMAZING Thanos print from one of the countless incredible artists at Wizard World Des Moines. Thanos is my dude. Around this time, “Rookie of the Year” Thomas Ian Nicholas was doing a concert on the main stage on the floor. Holy cow, it was amazing. Just him and an acoustic guitar doing songs. The first one he did was “Stacy’s Mom” – but he changed the lyrics to “Stiffler’s Mom” referencing his role in American Pie. Yeah, that was wonderful. Then he did “Smooth Criminal” by Michael Jackson. We had walked away at that point but that was absolutely a highlight of the day. From this and all his interactions with Jay, Thomas seems like the nicest guy ever. 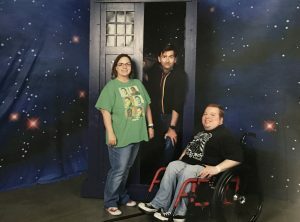 It was at this time where I missed David Tennant, but Jay was there – and met the dude, which is awesome, so I was only a little bit sad I didn’t get to see Kilgrave from Jessica Jones. Tennant was INCREDIBLE in that. He was also Doctor Who, which I guess is a big deal too. Maybe you’ve heard of it. I didn’t miss Elijah Wood, though. A veteran of this kind of environment, Elijah is best known for his role as Frodo Baggins in Lord of the Rings. That wasn’t the focus of his panel, though, as I had come to expect. He was asked about Wilfred, where he played an imaginary dog … man in dog costume… if you haven’t seen it, check it out, it’s real weird. He spoke about being in Back to the Future 2, even though he can’t remember most of it as he was just 8 years old, he is proud and happy to have been part of it. He did say he remembered Michael J. Fox being nice and very friendly, which is good to hear. Something that blew my mind was when someone asked about Elijah being in Red vs. Blue, a production of Rooster Teeth based in Austin, Texas. I love Rooster Teeth, and I had no idea Mr. Wood was a part of RvB. He lives in Austin part-time, the deal came through a friend. This led to Elijah explaining the roles he accepts, he prefers being challenged and having a character that has gravitas to it. Dude could coast through life living off Frodo, but he’s an artist and he loves doing what he does. Fantastic. 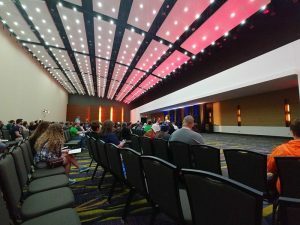 After a quick trip back down to the floor so the kids could play Fortnite and Super Smash Bros, the final panel we wanted to attend was set to begin. Before we got there, random as all get out, Kato Kaelin was revving up the crowd on the floor. Right on Kato. Iowa’s Most Haunted, hosted by Dave Schrader. 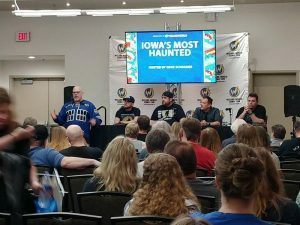 The panel was made up of two duos specializing in two of Iowa’s most notorious places – the Malvern Manor in Malvern, Iowa and the Ax Murder House in Villisca. 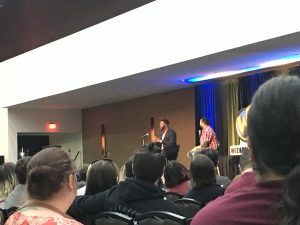 Author Richard Estep and owner of the Manor Josh Heard represented the Manor while curator Johnny Hauser was set to represent the Ax Murder House but he could not attend – in his place, Seth and Jesse Alne. All four knew a massive amount about their respective establishments, and shared some of their most terrifying moments. This one hit pretty close, as I have stayed at the house in Villisca for a night – we didn’t experience anything strange. Or at least that’s what I thought. Jesse Alne described an experience he had in the house which made him quit investigating all together. It was very similar to the experience we had at the house. Safe to say, I was spooked. After the panel all five gentlemen stuck around and spoke with anyone who wanted to. We ended up with a copy of Richard’s book and spoke with Jesse more about the Villisca house. 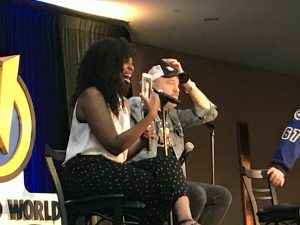 That wrapped my day at Wizard World Comic Con in Des Moines for 2018. Always a pleasure, easily one of the highlights of my year. 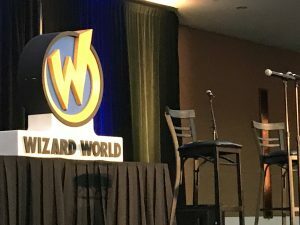 Wizard World Will Return May 10 – 12, 2019!